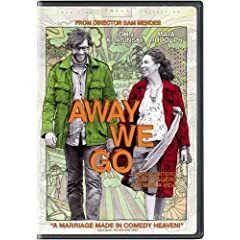 I’m adding “Away We Go” to my Movies You Might Not Know list. It’s a small movie (a la “Juno” and “Sunshine Cleaning“) about a couple in their early thirties who discover they’re going to have a baby. They decide they need a better place to live, so they take off on a road (and air) trip to Phoenix, Tucson, Montreal, and Miami. They stay with friends or relatives or old pals from college, all of whom have children and various levels of sanity. It’s this exposure to the world that brings the duo closer together. Maya Rudolph and John Krasinski play the couple beautifully. Rudolph really shines, proving that she’s capable of more than she did on several seasons of “SNL.” The supporting cast includes such stalwarts as Catherine O’Hara, Allison Janney, Jeff Daniels, Maggie Gyllenhaal, and Jim Gaffigan. “Away We Go” is funny, heartwarming, and original. See my entire Movies You Might Not Know list for more.